When financial consultant and financial engineer Jeffrey Weston began an extensive study of foreign bonds previously sold to American citizens, he quickly uncovered the scandalous area of global finance now coined "The German Gold Bond fiasco". Starting in 1994 Weston undertook the challenge of shedding light on and exposing the financial shenanigans of Germany and Wall Street that cost the American public hundreds of millions of dollars in the 1920's. 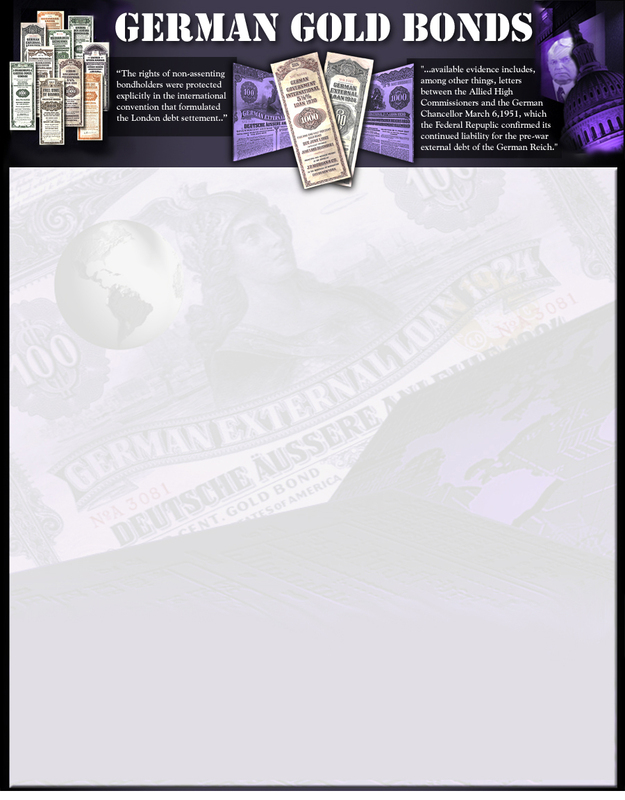 Now, 80 years later, the bonds that Germany issued in the 1920’s represent obligations totaling hundreds of billions of dollars. On this DVD, hosted by former FNN (Financial News Network) news anchorman Derek Partridge, many financial experts, attorney's, CPA’s, and historical film consultants, working partially with footage acquired from the National Archives in Washington, carefully piece together the sordid financial history and current opportunities represented by the German Gold Dollar Bearer Bonds both for the holders of the bonds and for Germany as well.